What's the big difference between Italian ice cream and ice cream? They are very similar. Gelato is simply prepared differently. Gelato has less air whipped into the mix making for a tastier, smoother frozen treat. And its served a little warmer so it won't freeze your taste buds. Come in and give it a try. You won't be disappointed. A Bay Area Favorite for 40 years! 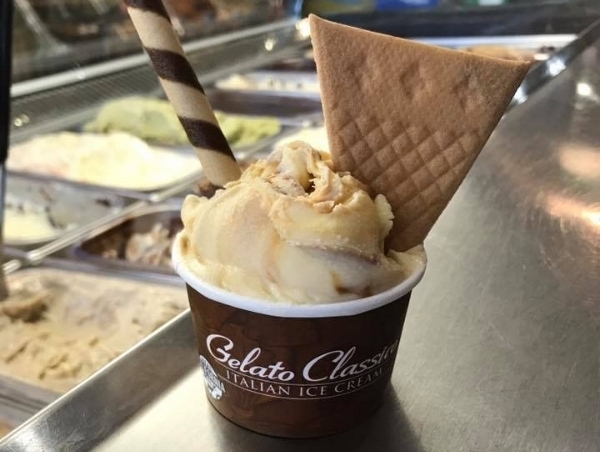 Gelato Classico is regarded as the top gelato maker in the United States. They make an ultra rich and creamy, hand-crafted Italian-style ice cream made with the highest quality ingredients including real California Milk. The also make a fat-free, dairy-free Italian Ice which is crafted with 80-90% high-quality fruit imported from all over the world. Gelato Classico's frozen desserts are sold in fine restaurants, cafés, scoop shops and grocery stores across the country. Why is Gelato So Great? Gelato is denser than other varieties of ice cream. As a result, gelato is packed with flavor and has an incredible texture. Gelato Classico is made in the East Bay with real California Milk. We serve 24 flavors of gelato every day. Customer favorites include: Honey Lavender, Cappuccino Chip, Crème Brulee, Dark Chocolate, Pistachio, Birthday Cake and Chocolate Covered Strawberry. Read the full list of flavors below. Italian Ice is 100% fat-free: Lemon, Mango, Raspberry and Strawberry. We blend some great drinks using our Italian ice. The Frozen Palmer is the most popular: Black tea and lemon Italian ice.